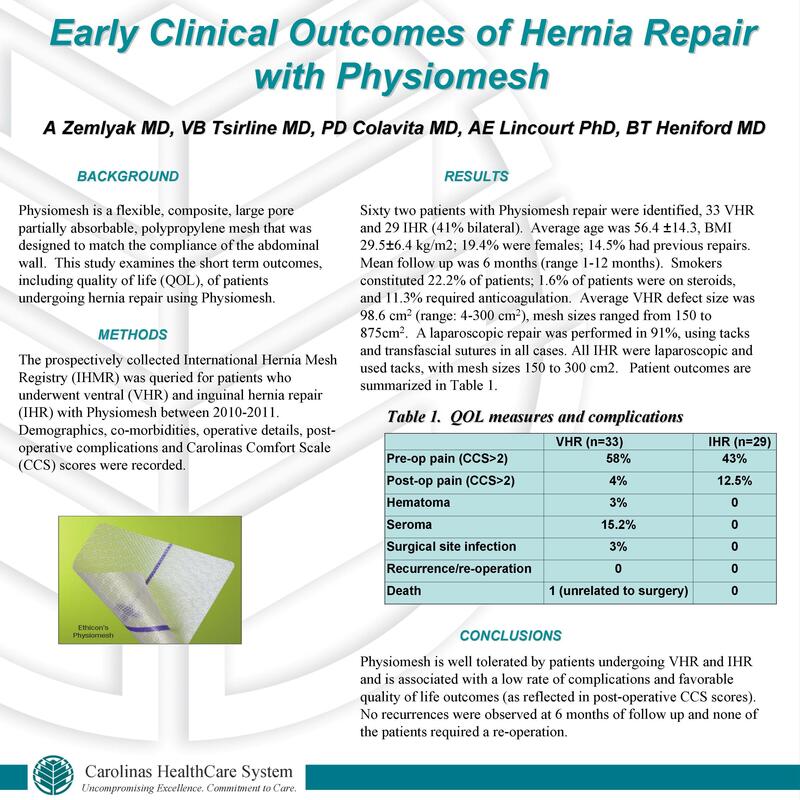 Physiomesh is a flexible, composite, large pore partially absorbable, polypropylene mesh that was designed to match the compliance of the abdominal wall. This study examines the short term outcomes, including quality of life (QOL), of patients undergoing hernia repair using Physiomesh. The prospectively collected International Hernia Mesh Registry (IHMR) was queried for patients who underwent ventral (VHR) and inguinal hernia repair (IHR) with Physiomesh between 2010-2011. Demographics, comorbidities, operative details, post-operative complications and Carolinas Comfort Scale (CCS) scores were recorded. Sixty two patients with Physiomesh repair were identified, 33 VHR and 29 IHR (41% bilateral). Average age was 56.4 ±14.3, BMI 29.5±6.4 kg/m2; 19.4% were females; 14.5% had previous repairs. Mean follow up was 6 months (range 1-12 months). Smokers constituted 22.2% of patients; 1.6% of patients were on steroids, and 11.3% required anticoagulation. Average VHR defect size was 98.6 cm2 (range: 4-300 cm2), mesh sizes ranged from 150 to 875cm2. A laparoscopic repair was performed in 91%, using tacks and transfascial sutures in all cases. All IHR were laparoscopic and used tacks, with mesh sizes 150 to 300 cm2. No complications were reported after IHR. Pre-operative pain (CCS >2) was present in 43% of IHR patients. Post-operatively, only 12.5% had a CCS>2. One patient died in VHR group (>30 days post-op); one developed a hematoma but did not require intervention. There was 3% incidence of superficial surgical site infection and 15.2% incidence of seroma. No early recurrences or reoperations were reported. Pain was reported by 58% VHR patients pre-operatively, while only 4% had a CCS>2 six months post-operatively. Physiomesh is well tolerated by patients undergoing VHR and IHR and is associated with a low rate of complications and favorable quality of life outcomes. No recurrences were observed at 6 months of follow up.